EJCPS supports local organizations in their efforts to develop and implement community-driven solutions that address environmental and public health disparities in minority, low-income, tribal and indigenous populations. The goal of the Environmental Sustainability program is to promote sustainable engineered systems that support human well-being and that are also compatible with sustaining natural (environmental) systems. These systems provide ecological services vital for human survival. Research efforts supported by the program typically consider long time horizons and may incorporate contributions from the social sciences and ethics. The program supports engineering research that seeks to balance society’s need to provide ecological protection and maintain stable economic conditions. 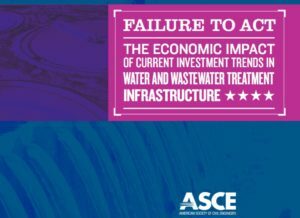 It’s no secret that infrastructure—including electric grids, fossil fuel pipelines, public transportation lines, bridges, railways, and roads—are in a rapid state of decline in the U.S., and that there is not nearly enough money allocated to their repair and maintenance. Central to that problem and probably the most alarming aspect of it is the fact that water infrastructure systems—the pipes that bring us treated water and the sewer lines that take waste water away—are in various states of disrepair all around the country.